Tanjung Aru (Malay for “Casuarina Beach”) can be found just four miles south of the Sabah capital in Malaysia: a 1.3-mile stretch of coarse sand facing the west where locals can be found gathering for picnics and posing for sunset selfies. Tanjung Aru is Kota Kinabalu's iconic beach, as much a part of the local lore as Bondi Beach is to Sydney or Copacabana is to Rio de Janeiro. Travelers to Sabah can join the locals gathering on Tanjung Aru's short esplanade, Prince Philip park, and late-night food court. The down-to-earth ambiance makes Tanjung Aru a great place to relax, gaze at the sunset, and dine on seafood caught only hours earlier. The beach's proximity to the Kota Kinabalu International Airport might detract somewhat from Tanjung Aru's romance, but don't worry, much of the action takes place at the beach's furthest removed from the runway. Starting at its northernmost point (where the Shangri-La Tanjung Aru stands) the beach curves gently in a general southward direction for about half a mile: this stretch known as First Beach is Tanjung Aru's most popular area, containing its best hotels, hawker stalls selling top-flight Malaysian street food, and clumps of locals enjoying typical beach sports like frisbee, football, and skimboarding. After First Beach stands the Prince Philip Park, built in the 1960s. The shady trees have some interesting, Borneo-only residents hiding within, including blue nape parrots and oriental pied hornbills; many locals like to settle down to a picnic at this spot. Past the Prince Philip Park, you'll find Second and Third Beaches, not as popular considering their uncomfortably close distance to the airport runway but still popular among locals as a site for tai chi, beach sports, and fishing. 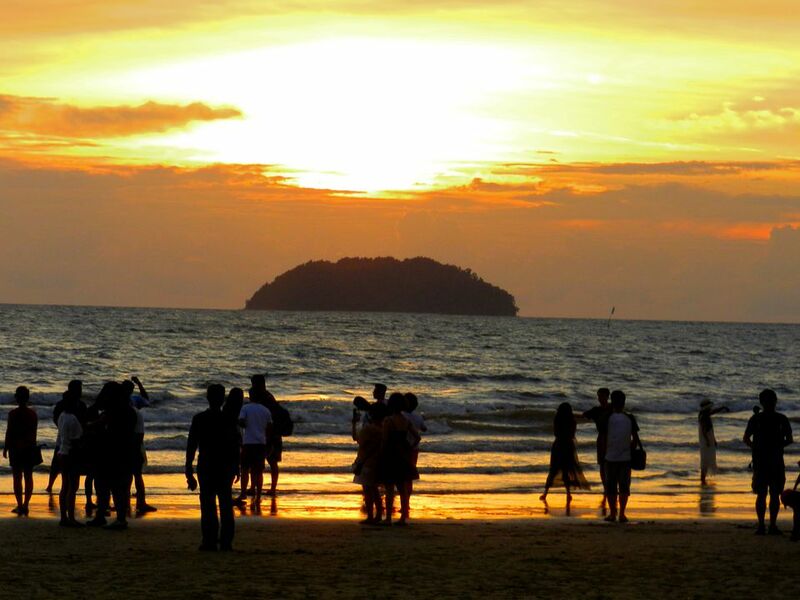 Spectacular fails to describe the nightly sunset viewed from west-facing Tanjung Aru Beach. Most activities come to a halt, as onlookers watch the final moments as the sun dips below the water, with Mamutik Island and the Tunku Abdul Rahman Marine Park silhouetted in the foreground. Even if staying in Kota Kinabalu, catching a taxi to Tanjung Aru for dinner and the sunset is well worth the effort. Aside from enjoying a long, flat stretch of beach for walking or jogging, the only other real activity to enjoy around Tanjung Aru is eating. The open-air food court offers centralized seating surrounded by dozens of stalls offering great Malaysian noodle dishes and fresh-caught seafood. Fish, lobster, stingray, and a variety of shellfish are sold by weight and stir-fried or grilled to perfection. Most menus vary little between stalls. Instead, shop around to take advantage of discounts generated by fierce competition. Some food stalls stay open for drinking and socializing well past midnight. Depending on the season, vendor carts selling Southeast Asia's infamous durian fruit set up outside of the food court. Tanjung Aru is located only four miles south of Kota Kinabalu; the ride takes less than 15 minutes by taxi or 20 minutes by bus. Public buses and minibusses to Tanjung Aru leave regularly from City Hall and Wawasan Plaza in the southern part of Kota Kinabalu. Take the #16 buses signed "Tanjung Aru Beach" and turn around in the parking lot of the food court—the last stop—before heading back to the city. Let your driver know if you want to get off at the backpacker's hostel or at a hotel prior to the beach. The one-way fare is typically around MYR 1.50, or 30 US cents. You can avoid crowded public transportation by flagging a southbound taxi to Tanjung Aru Beach for around MYR 15, equivalent to about US $3.30. Ensure that your driver uses the meter before getting inside. And yet all of this could change in a few years if a 350-hectare waterfront development is approved to transform Tanjung Aru into a high-end resort district. The Tanjung Aru Eco Development (TAED) plans call for new buildings along Tanjung Aru, with at least seven new resort/hotels on the drawing board, as well as condominium complexes with more than 5,000 units. The blueprint also includes walking and cycling tracks; an ecology center; a 133-hectare Greg Norman-designed golf course; a marina; and a beachfront promenade. The controversial development has been silent since 2016 and is awaiting a green light to move forward.